The power of the vote extends beyond any single electoral outcome. It has the potential to lift up important community issues, reorient the priorities of those elected to the interests of the people, and support an engagement process that extends into the policymaking process. It is also a critical ingredient to building community trust and resiliency as well as supporting the goal of economic mobility. Increasing voter participation can boost our state’s economic well-being and ability to solve our persistent challenges in communities across the state. Yet one of the six state Constitutional amendments that will be on the ballot this fall proposes to erect a new barrier to voting by requiring a photo identification to vote. Laws like this have been well-documented as harmful to voters working for low incomes and poor voters of all races, while specifically targeting Black and Latinx voters. It is a proposal that is costly to us all. It will mean that state and county governments have to spend at least $12 million on staffing polling sites, providing identification cards (should they choose to do what courts have required in the past), and conducting the necessary voter education and outreach to ensure people are aware of the requirement. That amount is roughly equivalent to what the state will spend this fiscal year on telemedicine to reach people with barriers to accessing health care providers and to ensure school safety programming and grants. As we think about disaster recovery for our entire state, it is the amount of money the state invested in landslide mapping, acquiring and installing flood monitoring systems and assessing inundation zones, funding North Carolina Search and Rescue services, and supporting Forest Service emergency response vehicles. It could go now toward meeting immediate needs in directly impacted communities. 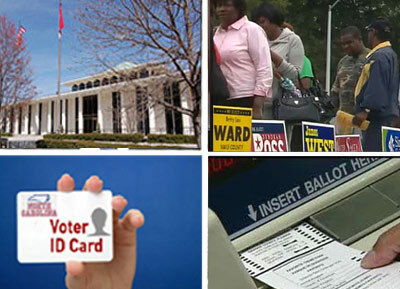 Unlike an expensive voter ID scheme, which will cost the state, localities, and individuals a great deal without clear benefits, all North Carolinians share the benefits of well-planned investments in schools, high-quality health care, robust disaster recovery plans, modern and accessible elections, and other public goods that form the foundation of thriving communities. Such diversion of resources — that are now more limited in our state because of successive tax cuts for the rich and big companies — in order to block participation in the democratic process for some puts our state’s economic well-being at risk. People across the state — but particularly in rural communities and voters of color — will face high costs in obtaining a photo identification, even if the state provides an identification card without a fee. (It isn’t even clear in the ballot language that they will do that much.) The costs alone of traveling, wait times, and acquiring supporting documents are enough to detract from family priorities like buying groceries, providing quality child care, or paying utility bills. Its impacts will ripple through communities in the near term. But its most damaging economic effects will be those more difficult to quantify. By seeking to block the voices of a few—Black and Latinx voters, voters with low incomes and those living in poverty—it seeks to further divide us and suggest that we can’t work together to solve the persistent challenges we face. We can. But, to do so, every eligible voter should have the opportunity to ensure that the choices that get made strive to achieve a stronger economic outcome for us all. Every eligible voter should be able to participate in the democratic process with a vote and not be blocked because of cost. Expanding participation in civic life—and voting—strengthens our policymaking process and our economy. It should be the goal of our leaders to do both. A photo ID requirement in the state constitution would block us from achieving those goals.